At the modern prefab house, there was rain rain rain, then sun. On rainy days, the off grid cistern fills... Pip 2 and I awake with dawn, but with the drumming, soothing downpour, it is harder to rouse the boys. In the blink of an eye, Pip 2 was turning 13. After everything she's been through this year, I thought she needed an adventure. So off to Newwwwww Yawk Cit-tay we went. Thanks for loving her up, New York. On the train, she started having issues which we now think are Lyme-related. So on doctor's advice, once landed in Penn Station, off to the ER we went. Weary, we dragged suitcases into the waiting room and announced, "This chile hasn't been in New Yawk two seconds and she's already in the ER!" "AAAAAAYYYYY! WELCOME TO NEW YORK! Where you from?" And with that, she met, even in bad times, the best of New York. Country friends shudder when thinking of the city. I have always told them that in large cities, community is just as strong, there's just more of them. This trip was filled with New York generousity and kindness, often by strangers. New York: you're good people. Where we stayed in the East Village was in a new, fire-proof, energy efficient building. The apartments are small footprint, of course, and after living for years in an energy efficient, off grid modern prefab house that is also a small footprint home, it was fun to compare the two. Life in the East Village! At our off grid modern prefab, the focus is on outdoors, yes. But it's just large enough that when we DO want to entertain, we can have a lot more people than you think- thanks to the set up of the great room, the dining table seats eight, add a card table on the end and now you're twelve, and with the seating area plus coffee tables, you can seat another eight! Not bad. Somehow, after the ER, we made it to Hamilton. This is Pip 2's "I-can't-believe-I-just-left-the-ER-and-am-now-at-Hamilton" face. The next morning, dear friends told Pip 2 loads of stories about my East Village years... and she shined, being loved on by such wonderful people who generously took her into their world. From there, it was on to Little Italy. But it was not the Little Italy I wanted to show- instead, there were hurried crowds, honking traffic, tables upon tables with waiters urgently waving you in... 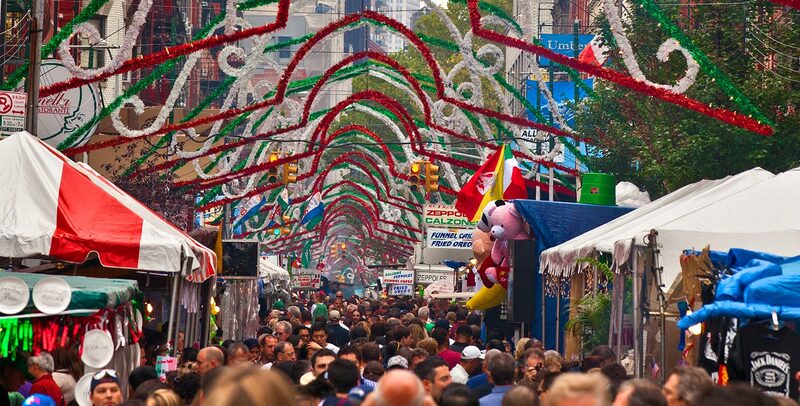 I realized that when I lived in New York, we were usually just there during the Feast of San Gennaro, and without the festival, processions, twinkling lights, street food and music, it just wasn't the same. How to convey this special place to her??? Thankfully, we discovered the Italian American Museum, where the director, Dr. Scelsa, told Pip 2 all about his beloved neighborhood, its history, and how one brave cop defeated the nefarious Black Hand. I have now ordered the book The Black Hand so I can know everything before Leonardo DiCaprio's movie on it hits the theaters! We spent a split second in Chinatown, enough to know that if you have alpha gal and are anaphalaytic to mammal, that place is full of fumes and crowds to trigger your panic, so out out out we went. Ahhhhhh the quieter streets of SoHo soothed us. We ended our walk with a true New York tradition: meeting a friend under the arch in Washington Square. Caravan of Dreams, near Tompkin's, finished a lovely day. Oh New York, you were so good to us. And we were good to ourselves- of course we had breakfast at good ole B&H! When New York decided to monsoon on Day 3, we headed to the Met and spent the day there with friends while it stormed. Make sure you see the Painter of the Northern Lights exhibit, it's superb. The lovely beautiful Miz V accompanied us to the Met and dinner, despite having just landed from London. New York is the kind of place where even public transit is poetic. The Atlantic Coast Pipeline puts the environment and local communities at risk. "...Perhaps that’s because the mortgage-interest deduction overwhelmingly benefits the sorts of upper-middle-class voters who make up the donor base of both parties and who generally fail to acknowledge themselves to be beneficiaries of federal largess. 'Today, as in the past,” writes the historian Molly Michelmore in her book “Tax and Spend,” “most of the recipients of federal aid are not the suspect ‘welfare queens’ of the popular imagination but rather middle-class homeowners, salaried professionals and retirees.” A 15-story public housing tower and a mortgaged suburban home are both government-subsidized, but only one looks (and feels) that way. It is only by recognizing this fact that we can begin to understand why there is so much poverty in the United States today." What a week. I'm grateful for all the love (and stories!) New York shared with our daughter. We are back in the off grid prefab house in population 40, so happy to be home, but leaving a piece of our hearts, always, with New York. But New York, we love you.